For blacks with mental illness, the odds of coming away from an encounter with police unscathed are stacked overwhelmingly against them. 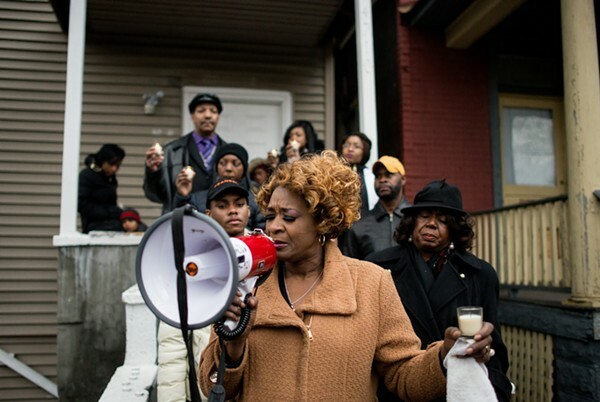 Evelyn Glover-Jennings holds a prayer with her family and west-side officials on December 27, the day after her cousin Bettie Jones was shot and killed by Chicago police. One out of every four police shooting victims has a severe mental illness. That lesson was echoed this holiday season when Chicago police encountered 19-year-old Quintonio LeGrier in the midst of an "emotional problem" and shot him dead, allegedly without warning, according to a lawsuit filed by the teen's father. And the list goes on. In February 2012, a black, autistic 15-year-old was killed within seconds of encountering Calumet City police after the boy's family called 911 for help. In December 2012, Philip Coleman died in a hospital after police tasered the 38-year-old several times and dragged him out of a police lockup on the far south side following a psychotic breakdown. In March of this year, a black 39-year-old bipolar, schizophrenic man in Dallas named Jason Harrison was also killed by police. Officers had been to his home "a hundred times or more without incident," according to a lawsuit, but the final response came after the man's mother requested assistance getting Harrison to the hospital during an emotional breakdown. Again, within seconds of an officer's demand to drop a screwdriver Harrison was fatally shot five times. A graphic video of that encounter shows what can happen when police are tasked with providing mental health services. "By all accounts—official and unofficial—a minimum of one in four fatal police encounters ends the life of an individual with severe mental illness," according to a report from the Treatment Advocacy Center, a Virginia-based nonprofit dedicated to eliminating barriers to the treatment of severe mental illness. "Given the prevalence of mental illness in police shootings, reducing encounters between on-duty law enforcement and individuals with the most severe psychiatric diseases may represent the single most immediate, practical strategy for reducing fatal police shootings in the United States." The December 2015 report, "Overlooked in the Undercounted," finds that the risk of being killed during a police encounter is 16 times greater for individuals with untreated mental illness than the general population. Other research shows that whites are more likely to perceive blacks as violent, dangerous, and in possession of superpowers than they perceive other races. For those who are black and have mental illness, the odds of coming away unscathed from an encounter with police are stacked overwhelmingly against them. In a city where police "accidentally" shoot and kill a woman within moments of fatally shooting a 19-year-old man undergoing an emotional breakdown (and later that same day shoot a third person), serious questions regarding officer training and misuse of force remain unanswered. Aside from the police department via a statement offering a public apology to the family of LeGrier's neighbor Bettie Jones, who was mistakenly shot and killed by Chicago police officers shortly before the teen was killed, answers as to what prompted the shooting of LeGrier remain elusive. #CPD keeps emphasizing they 'accidentally' killed #BettieJones while providing no explanation as to why they killed #Quintonio on purpose. What has emerged is a rethinking of the police department's Crisis Intervention Team program, which teaches de-escalation techniques to officers responding to mental health crises, as Mayor Rahm Emanuel and interim police superintendent John Escalante announced following the weekend police shootings. "There are serious questions about yesterday's shootings that must be answered in full by the Independent Police Review Authority's investigation," Emanuel said in a statement on Sunday. "It is clear changes are needed to how officers respond to mental health crises." What's unclear is how better CIT training could have saved Bettie Jones, the "accidental" victim. Or Mekel Lumpkin, the young father who was shot by police five times on the south side hours after Jones and LeGrier were killed. Witnesses say Lumpkin had a gun but put it down when police arrived. Instead, the mayor's announcement has deftly shifted attention away from the larger issues of excessive force and lack of accountability in the police department. Meanwhile, a report from the Chicago Tribune detailing police radio traffic and 911 dispatch information shows that responding officers may not have known that LeGrier was in mental distress at all, meaning that dispatchers would not have specially requested a CIT-trained officer. 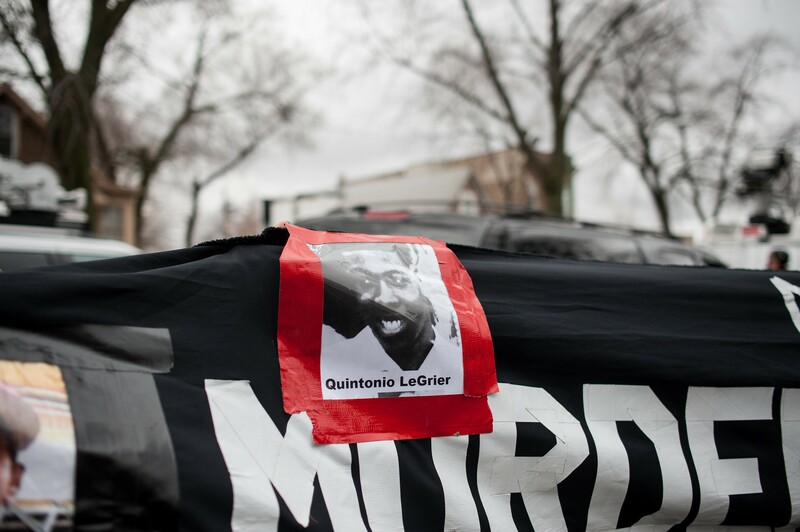 Police shot and killed Quintonio LeGrier on December 26 while the 19-year-old was in the midst of an "emotional problem." Odds are that knowledge of LeGrier's mental state wouldn't have changed the outcome: as of this month, only 1,800 of CPD's approximately 11,000 officers were trained in the perennially underfunded, voluntary CIT program, and "less than a majority" of mental health calls are responded to by a CIT-trained officer, according to 2014 congressional testimony from then-first deputy superintendent Al Wysinger. And as many critics were quick to point out, Mayor Emanuel in 2012 closed six of the city's 12 mental health clinics—largely in low-income, high-crime neighborhoods—without holding hearings or initiating a study or task force. Lacking the proper services or treatment, family members are left to call police when a loved one suffers from a mental episode. Faced with an overzealous criminal justice system, many mentally ill people wind up in Cook County Jail, which has been called America's largest mental hospital, even in the words of its own top official, Cook County sheriff Tom Dart. This piece was published in collaboration with City Bureau, a Chicago-based journalism lab. Patients now face months-long waits for treatment as health-care workers struggle to do their jobs. The Invisible Institute was demanding the release of any police video of 2014's fatal shooting of Laquan McDonald even before it was certain a video existed. It was a symbolic seat for victims of gun violence. So why did the president all but ignore that issue in his speech? Hey, Mayor Rahm, reopen the mental health clinics! Looking to blame someone or something for the failures of his reign, Mayor Rahm discovers "mental health crises" four years after he closed mental health clinics in low-income, high-crime neighborhoods. Stephon Watts was diagnosed with Asperger's at age nine—and shot dead by Calumet City cops at age 15. Now his family is working to keep other kids with autism out of the line of fire. A City Council hearing on the clinic closings is canceled almost as soon as it's announced. The mural dedicated to the late Chicago DJ lasted 415 days in Logan Square.